FSCaptain is an add-on to Microsoft Flight Simulator (FS2004 or FSX) or for P3D simulator that expands the program so you can experience the challenge of professional flying in the modern world of aviation. That's what we mean when we say "making flight simulators into aviation simulators". FSCaptain takes the boredom out of Flight Simulator by giving you a reason to fly and a highly realistic professional modern aviation environment in which to prove and develop your skills. You might be an ace at handling your airplane, whether that be a light twin or a B747 or an A380, but can you fly it meeting the demands that real-world pilots face? 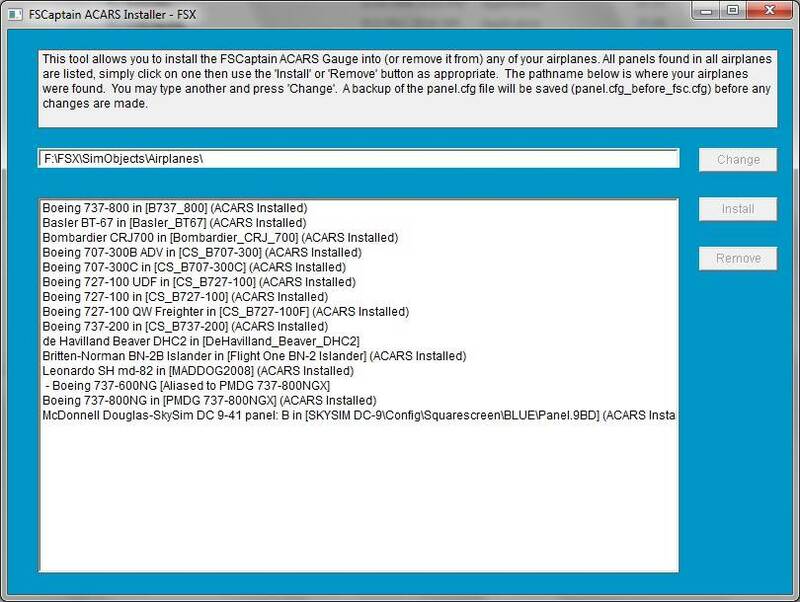 FSCaptain provides what Flight Simulator left out in simulating the modern aviation world. You'll have a company to work for, and they will have rules and policies you need to follow. You'll have a flight crew and a cabin crew (if you're flying an airplane large enough -- FSCaptain isn't just for Big Iron, you can be a small plane or bush pilot if you want.) But much more than that. You'll have passengers and/or cargo to haul and the passengers will react and measure your performance -- and so will your employer. What they'll want is for you to make every flight safely and on-time with happy passengers or intact cargo. As you start your career you'll find that now your flights have much more meaning. You are building a record, a record of professional accomplishment, not just a log. And suddenly with FSCaptain the safe world of Flight Simulator is more like reality. Thunderstorms are dangerous now and need to be avoided. Icing is a real threat, and runways and taxiways can be slippery and dangerous. Don't forget to use your anti-ice. Have you been ignoring things like cabin pressure and temperature? You can be sure your passengers won't ignore them, so you better not. And there are birds in the air you could hit, or you could experience any one of dozens of mechanical failures, or have a passenger with a medical emergency, or even have smoke seeping into the passsenger cabin. Are you up on your emergency procedures? By default these emergencies are rare, like in the real world, but they can happen. You may be used to working with ATC realistically, but have you experienced the other side of professional pilot life, dealing with your company and its dispatchers? You will in FSCaptain. Because that's real life in the real world of aviation. Beyond its commitment to realism, FSCaptain is comprehensive and flexible. You can take on any role you feel up to -- from a newbie cargo captain for a small outfit in a remote area of the world to the prestige of commanding a huge widebody passenger airliner with its substantial cabin crew. You are not limited in the type or size of the aircraft you can start your career with. You can choose to fly for cargo or passenger airlines, or those that do both. Your airline can have easy policies to adhere to, or they can be difficult. You are in control. 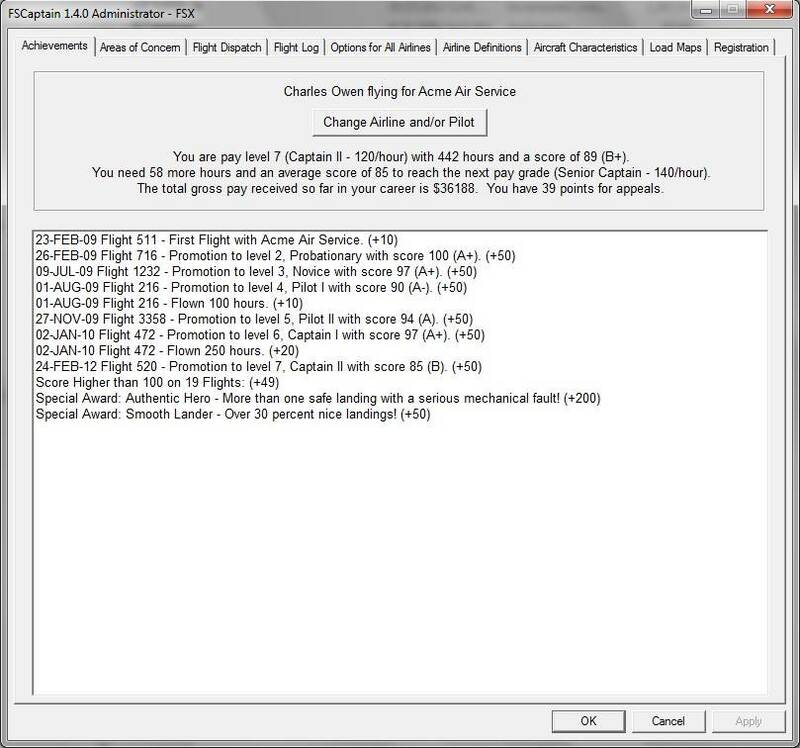 You can create your own airlines or fly one of the dozens of real-world ones provided with the package. You can even import AI schedules from inside Flight Simulator or from some AI package websites (any schedules, even those that you may have added from third parties) and make them into FSCaptain airline schedules. FSCaptain is easy to install and use, but it is not a cakewalk to climb the ladder of success. Each flight you make is graded, and to advance up the pay steps for your airline requires a minimum time in hours flown for each advancement along with a minimum average flight score for the level you are currently on. Much of your flight score is based on your on-time performance -- just like in the real world. But also, passenger satisfaction and adherence to company policies as well as safe operating practices are all factored in. You will feel the pressure real pilots feel to meet schedules and be on-time, but not to cut corners with safety. Your flying skills will mostly determine your ability to keep the customers happy while they are riding with you, but your timing and communication skills are important too! If you want more realism and a more professional approach to the job of being a virtual airline pilot (cargo or passenger) FSCaptain might be for you! Try it and see -- the demo is free and does everything the registered program does, except allow takeoffs from anywhere in the world. NOTE: Because the demo is made available to you to "Try Before You Buy", the developer does not offer refunds on this software once it has been purchased. When you order this product from PC Aviator Australia, you are buying the license/registration code to unlock the full functionality of the software and remove the airport limitation from the product. Note that we will also offer you the link to download the software, but if you have the demo installation from above, you do not need to re-download the software from us. Just use the registration code we provide to register and unlock your demo copy for full functionality. Three versions for the price of one - FSCaptain works in FS2004, FSX and Prepar3d! Support for multiple installations on the same computer, and you can even have the same career in all your installations even across versions! 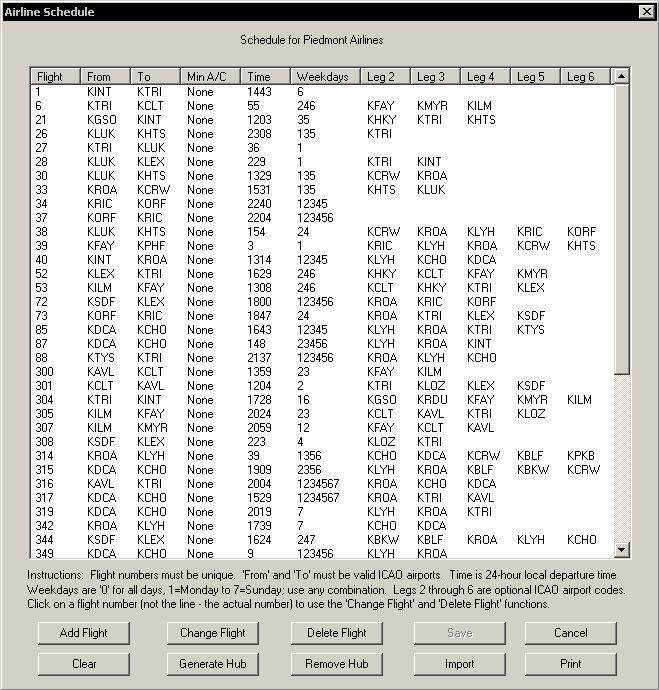 An ACARS gauge is provided for easy and efficient communications with your dispatch office. Accept (or decline) assignments from your employer -- just like the real world. Be assigned to scheduled flights, charter flights, or choose non-revenue ferries where you select the destination. Fly passenger or cargo flights, sometimes with special requirements such as priority delivery or fragile cargo. You're not alone: you fly with a first officer, cabin crew, and passengers who react and whose satisfaction is your major concern after safety. The loading and unloading of passengers and/or cargo are automatically handled by gate staff and ground crew. Cabin service is handled realistically by your cabin crew -- you set parameters but do not micromanage. You'll interact with the dispatch office to plan and monitor your flight. You face the real-world hazards of aviation: FSCaptain includes a wide array of potential mechanical failures, bird strikes, blown tires, and other hazards even medical emergencies and smoke in the passenger cabin. FSCaptain will even optionally enhance the effects of hazardous weather in Flight Simulator (either version) including making thunderstorms and icing dangerous -- even making runways and taxiways slick when frozen over! Your career is tracked and evaluated and your professional skills will be rewarded as you move up the ladder of success. But watch out: your flaws are tracked closely too! The financial side of your airline is handled by the bean counters and executives -- you are a captain and your concern is delivering your payload safely to your destination on time with consummate professionalism. You aren't limited in the size or type of aircraft based on your career position. Fly your favorite airplanes right off the bat. 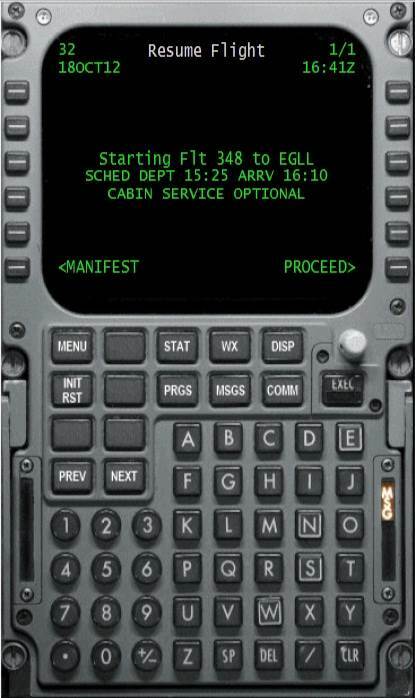 Create your own schedules or import them from the AI schedules inside Flight Simulator. The risk factors for failures are fully under your control, but by default they are very realistically implemented, quite rare and completely random. Airline policies are configurable in detail from the simplest to the most complex -- even down to how effective their maintenance operations are! Aircraft characteristics are configurable, including detailed fuel and payload charts. Support for reporting your flights automatically over the internet to your Virtual Airline using the already established FSPassengers reporting format. 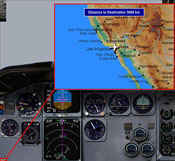 The free version of FSCaptain is fully functional and not limited in any way except for operations must be conducted from three airports located in the pacific northwest of the USA. The registration code which you purchase simply removes this restriction. You can evaluate the program at no expense risk-free for as long as you like. 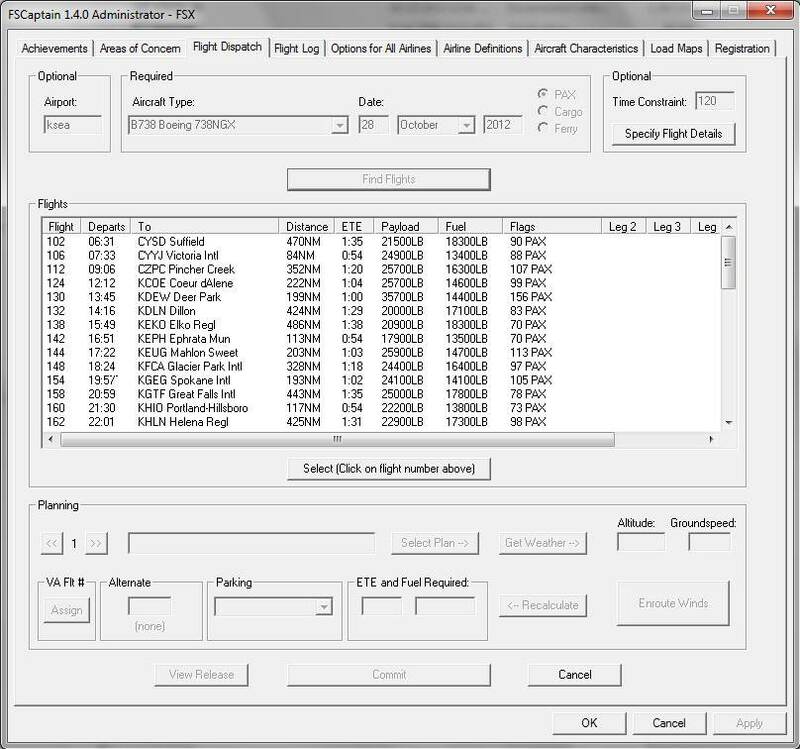 FSCaptain is carefully designed to be safe to install -- it does not modify your flight simulator or your Windows in any way except to add its own separate database folder and two gauges to your gauges folder. The Windows registry is not touched in any way, shape, or form. 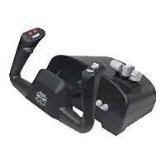 The gauge installed in your aircraft (the FCOM) is easily installed or removed by a program with no tweaking needed. It is unobtrusive and not seen unless called up, and it does not affect the appearance of your panels in any way. Your flight logs are carefully stored and backed up automatically to eliminate the risk of loss of your valuable career data. Purchased this product last month (October). Have been using a joystick for a few years and thought it time to upgrade, BEST thing I did. Easily attaches to the desk, movement is nice and smooth, nice location of buttons etc. Have only programmed in FSX (don't have FSUIPC) but works well. All in all a good purchase and would highly recommend this product.